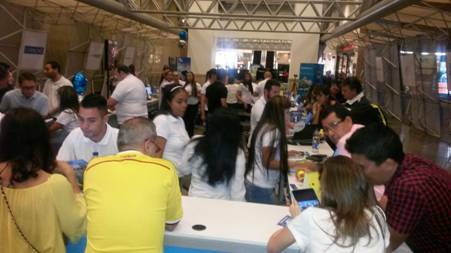 The first edition of Escapate ABC Fair took place between June 10th to June 12th, at luxurious El Tesoro shopping mall in Medellin. The strategic main sponsors were Insel Air and UltraViajes/DestinoJet.com. UltraViajes is an operator with a miles plan alliance with BanColombia (one of the largest bank in the country), MasterCard, El Tiempo Newspaper (section Vivamos), Euro supermarket (350.000 clients) and active promotion on social media. With a very nice set up concept, the three days touristic fair counted with 14 specialized travel agents located at different counters, selling packages to upscale consumers to Aruba, Bonaire and Curacao. The special on air tickets were US$ 250 for either island and US$ 350 for those visitors who wanted to combine the three islands. Promotion valid to travel until December 15th. A beautiful 8 pages printed flyer was distributed at the show which had the special packages from our Hotels on island. It was a great opportunity to promote Bonaire with sister islands Aruba and Curacao. Many visitors stopped at the Bonaire booth requesting information of Bonaire and were given the beautiful Bonaire booklet in Spanish. 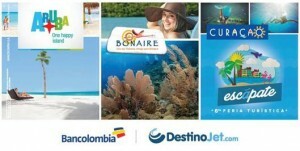 Ending the ABC Fair, TCB-LA agreed with UltraViajes to develop a Bonaire incentive program directed to its sales force. Those actively selling Bonaire will be invited to the island on a fam trip. During the ABC Fair, an incentive price based on 3nights/4days stay, courtesy of Eden Beach, was awarded to the most efficient sales representative selling Bonaire at the show.